After 20 years of discussion, conceptualization, political struggle, and technical reverses, Europe has placed its first two fully operational capability (FOC) Galileo satellites into orbit today (August 22, 2014). 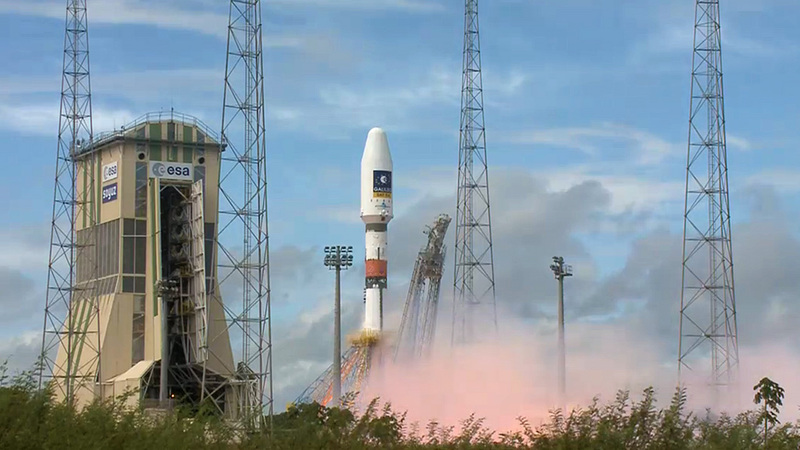 The Galileo 5 and 6 satellites were carried aloft on a Soyuz rocket from Europe’s Spaceport in French Guiana at 12:27 GMT (14:27 CEST, 09:27 a.m. local time). 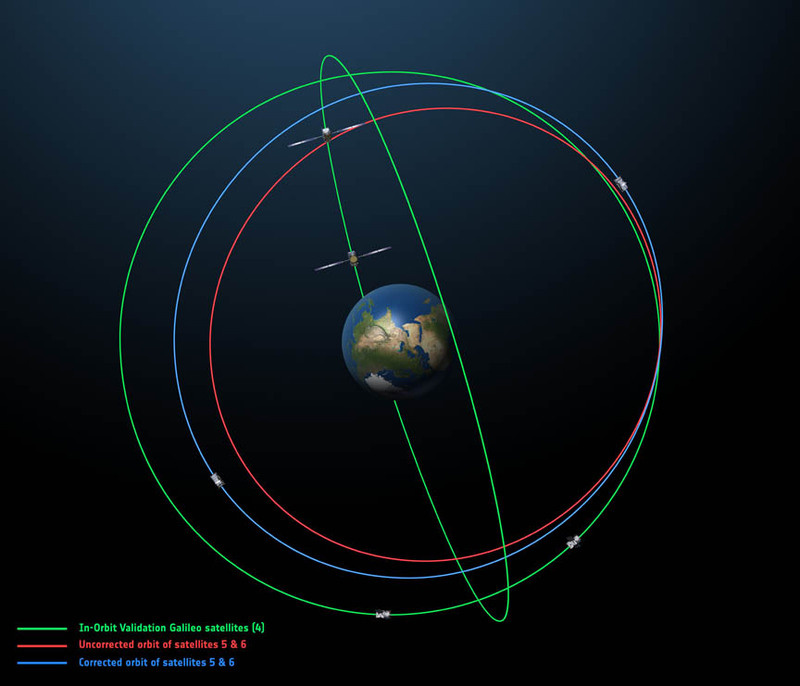 They join the Galileo in-orbit validation (IOV) satellites 1–4, one of which has been offline since May. The FOC spacecraft reached their orbit at an altitude of around 23,000 kilometers three hours and 47 minutes after launch on board a Soyuz rocket, shortly after they sent their first message of operational life to the European Space Agency (ESA) control center (ESOC) in Darmstadt, Germany, where the initial checks will take place within the next couple of days. This launch marks the start of a new phase in the European satellite navigation program during which the full constellation will be deployed with short intervals between launches. In about a week, following completion of the initial checks run jointly by ESA and the French space agency CNES, the two satellites will be handed over to the Galileo Control Center in Oberpfaffenhofen, Germany, and the Galileo in-orbit Testing facility in Redu, Belgium, for testing before they are commissioned for operational service in the autumn. The deployment of the constellation will now gather pace, according to ESA, with six to eight satellites launched per year using a series of Soyuz and Ariane launches from the CSG, along with finalization of the remaining elements of the ground network. Following the successful qualification of the system during the IOV phase, based on four satellites launched in 2011 and 2012, the Galileo FOCs are being produced by OHB System AG of Bremen, Germany, and readied for the launch pad in series. The final constellation will consist of 24 satellites and is expected to be ready in 2017, complemented by six in-orbit spares. Surrey Satellite Technology Ltd (SSTL) is responsible for the construction and test of the FOC navigation payloads, which are based on European-sourced atomic clocks, navigation signal generators, and high power travelling wave tube amplifiers. The payloads are being assembled at the SSTL technical facility in Guildford, United Kingdom. The FOC phase is fully funded by the European Commission. The Commission and ESA have signed a delegation agreement by which ESA acts as the design and procurement agent on behalf of the Commission.